The Keynesians have a problem. Why has it taken so long to recover from the slump of 2008-9 even after central banks have applied Keynesian-style unconventional monetary policies? The answer from Britain’s leading Keynesian Simon Wren-Lewis and from America’s top Keynesian, Paul Krugman, is that capitalist economies in slumps are not self-correcting. So we need central banks to apply easy money policies, especially when an economy is in a ‘liquidity trap’, where everybody holds cash and won’t spend. And when interest rates are at zero (zero-bound) and nothing happens, we then need ‘unconventional’ monetary policies like quantitative easing (printing money to buy government bonds from banks) or negative interest rates (charging banks for holding cash). But even these policies are not working. The major economies are still growing well below previous trend growth rates and many still have not got their GDP per head levels back above pre-global crash levels. Indeed, a recent analysis by Eichengreen and O’Rourke shows that this Long Depression is even worse than the Great Depression, at least when measured by industrial output. Krugman points out that a new paper by former IMF chief Olivier Blanchard and others finds that recoveries can take a long time for ‘self-correction’ of up to six years – pretty close to what has happened since the end of the Great Recession. As Krugman puts it: “The long run is pretty long, in other words; we might not all be dead, but most of us will be hitting mandatory retirement.” I’m already there. So this is not a good advert for the success of Keynesian-style easy money policies. The retort of Simon Wren-Lewis is that if you think monetary policy is useless, what if a central bank hiked interest-rates at the depth of slump? Don’t you think that would damage an economy? So macroeconomic policy does matter. Or as another Keynesian, Nick Rowe, puts it: “The most dangerous idea in macroeconomics is that monetary policy doesn’t matter”. Now I’m sure that hiking interest rates when profits for corporations and house prices are falling would be hugely damaging. But this is like saying that pulling on a string (hiking rates or reducing money supply) will pull an economy down when it’s already down. But it does not follow that pushing on a string (cutting rates or increasing money supply) will make an economy go forward – as QE has proved. In a way, Marx’s theory of crisis is ‘self-correcting’. Capitalism is never in permanent crisis; slumps do not last forever. If capital values (means of production and labour) are cut enough to restore profitability through bankruptcies of weaker capitals and unemployment, then eventually those stronger capitals will start to invest again. However, in a depression, with low profitability and high debt, that could take a long time. Nevertheless, the Keynesians still look to show that macro policy can turn even a depression around and we don’t have to wait for ‘self correcting’ factors like profitability. Economics graduate Matthew Rognlie is a rising star in mainstream economics, recently feted by the likes Krugman and others for his trashing of Thomas Piketty’s conclusion that inequality was set to rise over the next decades unless there is policy action. Now Rognlie has been turning out fast some new academic papers. One recent paper argues that the Great Recession was triggered by speculative over-investment in housing – an Austrian economics explanation, as he says. But the Great Recession and the subsequent weak recovery show that, without macro management, economies may not self-correct as the Austrians believe. That’s because the loss of income for householders defaulting on their homes spills over into demand for real investment and spending. In another paper, Rognlie tell us that unconventional monetary policy (negative interest rates) can work in restoring investment and consumer demand as long as the demand for money is ‘elastic enough’. The trouble is that this does not seem to be the case in a depression – there’s no demand to spend money however much you create, if there is no profit in it. What was also odd was that this debate among the Keynesians made little mention of the main Keynesian policy: more government spending to restore economic growth. Krugman, Wren-Lewis, Rowe and Rognlie were only concerned with the efficacy of easy monetary policy. Yet this is the Keynes of the Treatise on Money written in 1931. After five more years of depression in the 1930s, Keynes then wrote The General Theory in which he recognised the failure of easy money policies and proposed fiscal spending instead, and even the ‘socialisation of investment’, as necessary to end the depression. Ironically, there is a new report out which updates the analysis of the IMF economists of a few years ago who reckoned that they underestimated the ‘multiplier effect’ of austerity (fiscal contraction) on growth. At the time, this was made quite a fuss of by leftists within the labour movement, as it seemed to prove that austerity was the cause of the Great Recession and the ensuing depression. So the original IMF estimates were right that the multiplier effect of more or less government spending on growth was small and not larger during the period of ‘austerity’ policies adopted by various European governments since 2009. Keynesian monetary policy appears to have made little difference in restoring economic growth and incomes since 2009 and Keynesian fiscal policy would not either. This entry was posted on December 2, 2015 at 11:54 am and is filed under capitalism, economics, marxism, Profitability, Uncategorized. You can follow any responses to this entry through the RSS 2.0 feed. You can leave a response, or trackback from your own site. That graph showing that global output recovery since 2008 has been “worse” than the recovery post 1929 is not exactly enlightening. 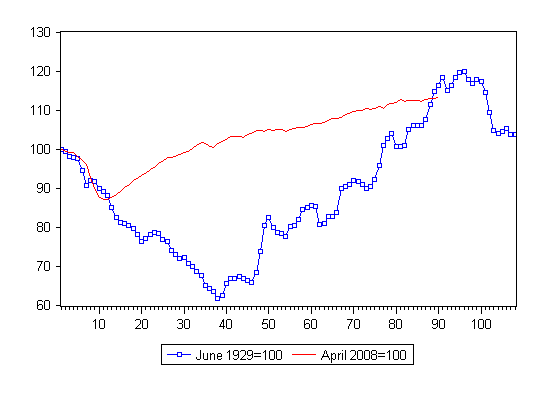 If the x-axis is months from inception, then the measures intersect at or near the 86th month (about 1936 for the Great Depression) The post 1929 uptick then continues before turning downward again (post-1937). That the decline post 1929 was so much more dramatic conditions the more dramatic upticks. The current contraction-recovery cycle is bad enough on its own terms, and IMO is going to turn back toward contraction.